Martha Graham Research Paper delves into the life of one of the top one hundred most important Americans in the twentieth century. “I am a dancer.” So opens the autobiography of Martha Graham. Considered to be one of the top 100 most important Americans in the twentieth century and the mother of modern dance, Martha Graham revolutionized dancing through her use of the body as a form of expressing deep emotion. Although her dance was considered shocking and ugly by some, Martha Graham was a pioneer who not only innovated a new dance technique but also was the first to employ Asian and African-American dancers and broke new ground in stage design and dance production. Martha Graham was born in Allegheny, Pennsylvania in 1894. She describes her childhood years in Pennsylvania as “completely bleak, and lacking life, brightness, and any discernable beauty,”. She attributes this to the coal industry of Allegheny, which required women and girls to wear veils, and turned everything black from soot. Nevertheless, Martha came from a happy family with loving parents. Her father was a doctor specializing in nervous disorders, an early form of psychiatry. Dr. Graham’s focus was on how people used their bodies. This focus, as well as his interest in finding truth whatever that truth may be, was passed on to Martha. Indeed, she recounts an incident with her father in which he showed her a drop of water and asked what she saw. She reported seeing pure water but with the use of a telescope, she was able to see “wiggles” in it. Dr. Graham used the opportunity to teach Martha that one must look for truth. “In a curious way, this was my first dance lesson- a gesture towards the truth,”. The bleakness of life in Pennsylvania was replaced with a “world of flowers, Oriental people, people with Spanish blood,” when she moved to Santa Barbara, California. It was in California, in 1911, Martha first saw Ruth St. Denis dance the famous The Cobras, Radha, Nautch, and Egypta solos. “I knew at that moment I was going to be a dancer,”. 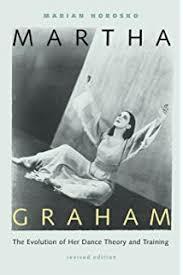 Although it has been reported that Graham’s father disapproved of her desire to dance , she discounted that indicating, “…my parents never objected to my becoming a dancer,”. Erick Hawkins - Erick Hawkins' choreography was influenced by his travels where he witnessed dancing ceremonies of Native Americans. Gus Giordano - Gus Giordano calls himself the “Grandfather of Jazz Dance”, a title he has earned through a rich history in jazz dance. Modern Dance - The Central Modern Period (1923-1946) was dominated by Martha Graham, who led the movement to find a uniquely “American” way of dance. Javanese and Balinese Dance - Martha Graham Research Paper delves into the life of one of the top one hundred most important Americans in the twentieth century. Dance History - Martha Graham and Doris Humphrey developed dances that were so dramatic and harsh that it challenged the idea that dance had to be graceful. The Diary of Nijinsky - Martha Graham Research Paper delves into the life of one of the top one hundred most important Americans in the twentieth century. Paper Masters writes custom research papers on Martha Graham and delves into the life of one of the top one hundred most important Americans in the twentieth century.